Discussion in 'Fletcher Knives' started by Fletcher Knives, Dec 14, 2010. I didn't want to have a bunch of different stickies in my forum for everything having to do with the knives, so I decided to make one master thread with all the info in it. Below you'll find links to each subject. Just click the link and it will take you to a post. Feel free to shoot me a PM or email if you think there is something I need to have in this thread and I'll check it out. I'm going to leave this thread locked so that it doesn't get cluttered with anything other than the necessary info. Thanks! 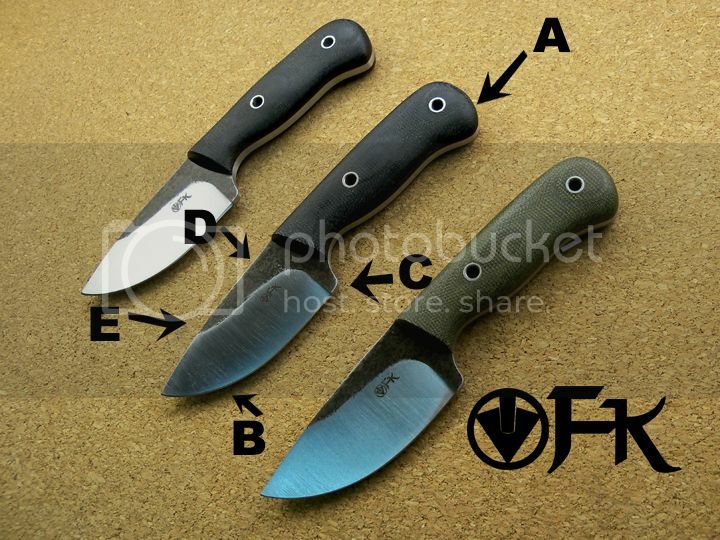 This is a post I made in the ESEE forum before I started making knives about how I sharpen my knives. The process now is slightly different. I bought a kit from DMT somewhere around 4 or 5 years ago. It's the one that comes with the clamp that holds the blade and it has the slots for different angles bla bla bla. I threw the clamp away when I bought it and I just use the diamond plates and sharpen by hand. I think their diamond ceramic plates are wonderful. Before that, I was strictly a stone guy. This is the kit I use. I also use smith's 3 in 1 honing oil. Sometimes, if I want things crazy sharp, I use a strop block loaded with green paste. This is where I got my strop block. For sharpening in the field, I keep a Smith's double sided sharpener with me. This is it. I'm a firm believer in hand sharpening. I don't use any of the Spyderco setups or sharpmakers or anything like that. 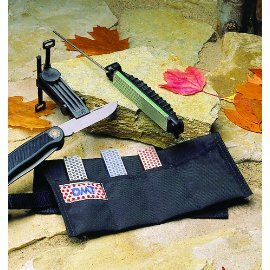 I've tried all of them and I prefer hand sharpening with stones / plates. Plus I think it's a very important skill to develop. When I start sharpening, the first thing I figure out is whether or not I want to keep the edge angle the same or change it. If I want to change it, or if it has significant damage I need to repair, I start with a course plate and reprofile the edge. For either of these reasons, I change the angle to about 15 degrees per side. I use that angle for almost every knife I own and I dig it. If I'm not going to change the angle, I'll move right to the medium plate. I always do a few swipes per side, using light pressure at a time, switching back and forth. I start with kind of light pressure and reduce the pressure as I work and it gets smoother. By the time I'm done with the medium stone/plate, I'm not applying pressure at all. The weight of the blade itself is the only pressure. I never even mess with the fine plate. I'll either leave it at that or strop it at this point. If you've had to do a good amount of work, it's always good to strop, because inevitably you now have a burr (steel wire) on your edge that has to be removed. Always remember when stropping, you'll have to make about 4 times as many passes with that strop as you had to with the stones. The best thing to do is just try to avoid the burr. One other thing, I always have a very light coating of 3 in 1 oil on my stones. I clean the blades thoroughly before I strop as to not gunk the strop up with oil or other contaminants. I think that's it. Did I leave anything out? One VERY important thing. If you can't get the knife sharp, it's you, not the steel. The crappiest steels in the world are the easiest to sharpen. Steels that are hard like D2 take longer because of how well the hold up. The steel doesn't want to give up any material whether you're using the knife or trying to sharpen it, that's why people want that particular steel. Common medium steels like 1095, 5160, O-1, etc. can get crazy sharp. It your knife isn't getting sharp, you're doing it wrong and you should try to find someone who can show you how to do it correctly or just look up videos and try try try. Practice is the name of the game. OR... you could take the easy way out and get the Spyderco setup. As far as getting the angle and everything all of that is still the same. The only difference now is that I only use two tools for sharpening, the Smith's double sided sharpener, and the strop. First I use a 1x42 belt sander to put on the initial edge. When I have that good enough, I move onto the Smith's. When I get the angle dialed in and get a good edge on it, that's when I strop. I test the edge sharpness throughout the sharpening. When I get done, I test the edge on hair, paper, and rope. If it shaves and cuts cleanly, I check the edge with a jeweler's loupe. to make sure there aren't any burrs I can't see. Somehow, some of these knives still show up to the customers not shaving sharp all the way up the edge. I'm still trying to figure this one out. I don't know if it's the sheath, some oxidation happening on the sharpened edge on a micro-level, or what. I'll get it figured out. Until then, if anyone ever gets a knife from Fletcher Knives that isn't crazy sharp right out of the box, please let me know or send it back to me and I'll sharpen it up for free. I thought I should copy this and put it in my forum also because I though it very informative. This was a post in response to a thread discussing how hard it was to sharpen certain knives and mine was one of the brands mentioned. 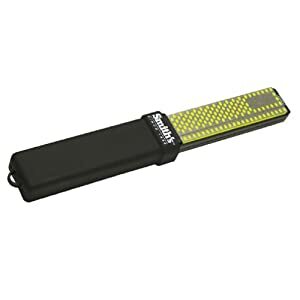 In that post, people started talking about all their various sharpening methods and different edge bevels, so that is where this post picks up. Howdy guys. I thought I might need to come in here and talk about my edges. 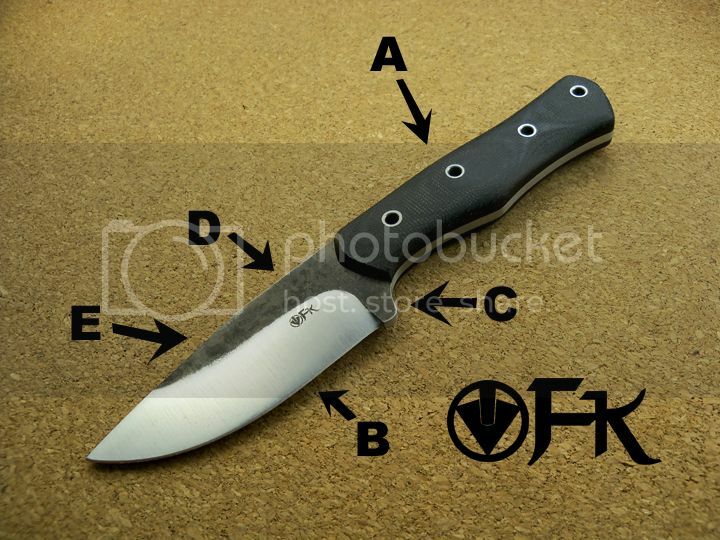 All secondary bevels on Fletcher Knives are just a standard secondary bevel. It doesn't take any fancy method what so ever to sharpen them. No mouse pads, special tools, big contraptions necessary. Originally, I smoked through the sharpening process when knives were finished. It took me a lot longer then to do a batch and I was trying to get them done and out the door. That's no longer the case. Here is why. One: I can finish a batch much quicker now so that isn't a factor, though it never should have been anyways. A while back, I got a knife back from my first customer (not the first Fletcher Knife he bought) and he told me he just couldn't do anything with the edge. It was too dull and he just couldn't get it sharp. I sat down and checked the knife out, and sure enough, dull as hell. It drove me nuts that this happened, because I pride myself on how well I sharpen my personal knives and it really upset me that I sent a knife out that was this dull. I spent about 20 minutes on it with my sharpening setup and it was hair popping. The customer is a great guy. He was nice enough to approach the whole subject in private and let me make it right. As a beginning maker, that was very good for me, because I didn't want to tarnish my rep right off the bat with something like that. This particular customer knows how to sharpen a knife, so it must have been hella dull if he couldn't get it sharp. At the same time, I got another knife back from a customer that had arrived to him dull. For the sake of this story, we'll refer to him as Scott. Scott called me and basically told me that the knife was way too dull and that he would try his best to sharpen it up. I said, "you can go ahead and send it back to me and I'll do it, or you can try it yourself and if it doesn't work out, I'll fix it." He decided to try it himself. A week later, he called me and said he just couldn't get it sharp, even with super-drastic methods. He explained to me his method and I cringed. I won't go into it, but I almost started crying while he was talking. That's when I realized that even though my customers are knife enthusiasts, that doesn't mean they have the best methods for sharpening knives. The best thing I can possibly do is make absolutely sure that the knives are good and sharp before I ever send them out. Moral of the story is, no matter what, the knives absolutely have to be sharp when they leave. I can't make it the customer's responsibility to make sure their knife is sharp. It shouldn't be on them to sharpen a knife right after they get it. The knife HAS TO BE SHARP when they get it. Now every time a batch gets finished, I sit down and hand-sharpen every single knife with stones and strop before it gets sent out. I make absolutely sure that every single knife is sharp. I never want anyone to have a dull knife when they get it ever again. I have damn near no hair left on my body, except that which is on my head, because I test every knife on hair, paper, and rope before it goes out. If anyone EVER gets a knife from me that isn't sharp right out of the package, please let me know. I would be more than happy to sharpen it for you. You shouldn't have to sharpen a knife that you just got. 1) It's not a convex edge. It's a standard secondary edge bevel. You can use any standard method to sharpen it. You don't need anything special. You can sharpen it with whatever method you like. Get as fancy as you want. If you don't want to sharpen it yourself or you don't have the best sharpening skills and would just rather someone else do it so you don't take any chances, send it to me and I'll do it for free. Just pay the shipping. 2) These edges are HARD. Fletcher Knives are meant to keep their working edge for a long time. If you wait for it to become totally dull, or it gets damaged before you sharpen it, or you're changing the edge angle, expect it to take a while. Once it's sharpened to your angle the first time, it will take less time from then on. Also, it takes less time the less it's allowed to get dull. If you take the edge all the way to hair popping sharp, it should keep a good edge for a loooooong time. Also again, if you don't want to sharpen your Fletcher Knife, send it to me and I'll do it for free. Just pay the shipping. I hope nobody reads this and thinks, "what a cocky a#$hole. Don't tell me how to sharpen a knife." lol. That is definitely not my intention. I always find myself writing stuff on Bladefroums and then having to read it over and over again to make sure that I don't give the wrong impression. I hope you guys know how much effort Andy and I both put into not only putting out the best tools we can, but also watching what we say as to not have it taken the wrong way. Since I started making knives, I've become more and more worried that someone on Bladeforums will take something I say the wrong way and then be like, "that guy is a d#$%head and I'll never buy anything from him and I'm going to spread the word." I never use a mouse pad to sharpen anything. I never use sand paper on an edge. I never use fancy stuff that lets you select and exact angle for your edge. I'm a simple country boy. We use stones and, IF we want it to just be stupid sharp, a strop. About the fanciest I ever get is my diamond impregnated stones from DMT and using my good eye. 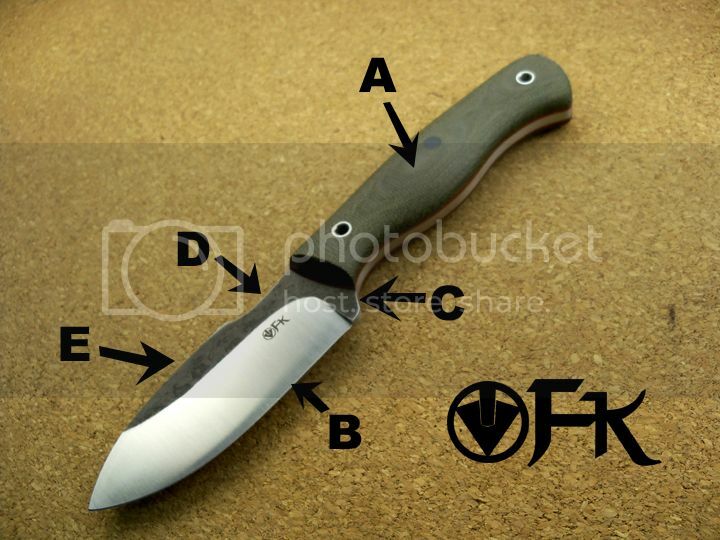 I think that some of the features of Fletcher Knives get lost in the photos. Sometimes, people may even miss them on knives in real life. Here is a quick thread to clear it all up. 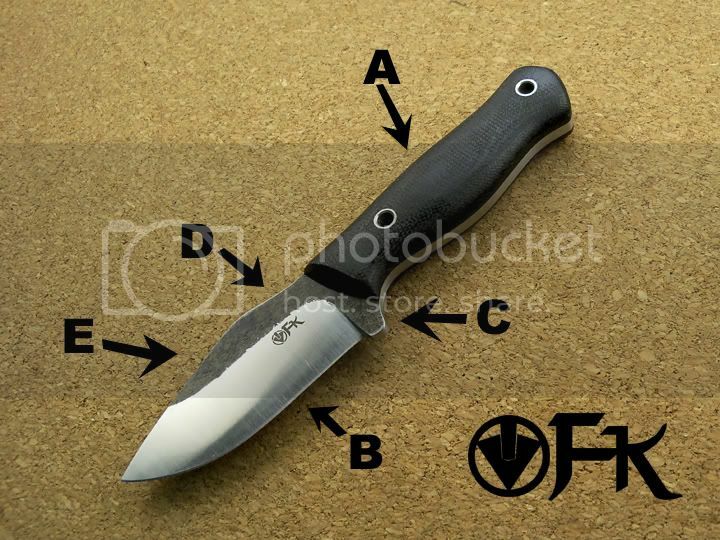 It's important to know the anatomy of your Fletcher Knife. Otherwise, you might think, "Dylan is out of his damn mind. He smooths out some areas and leaves other sharp." Here is why. Below you'll see a letter. Next to that letter is a description. If you match these letters with the corrisponding letter on the diagrams and the areas they are pointing out, you'll now understand why everything is done the way it is. The canvas micarta scales on Fletcher Knives are intentionally left rough. I try to ensure that they are smooth enough to be comfortable and that the shaping is perfect, but I sand and buff the handles in a way that leaves them with plenty of grip. The knife should stay stuck in your grip no matter what gets on it. The grind on a Fletcher Knife is almost always a Convex Saber grind and it sports a secondary sharpened bevel. A lot of convex grinds on the market these days go all the way to edge edge, giving it what is known as a "zero edge". That means that there is no secondary bevel and the primary grind of the knife goes all the way to the edge and also serves as the sharpened cutting edge. This grind/edge has its pros and its cons. The biggest con, and the one I'm trying to avoid by giving it a secondary bevel, is ease of sharpening. A lot of people think it's very easy to sharpen a zero edge convex grind. This is true if it is done correctly, but it's also extremely easy to do incoorectly and mess your knife up. If you would like to have a zero edge convex grind on your Fletcher Knife, you are more than welcome to do that yourself after you purchase the knife. I will ship every Fletcher Knife (almost without exception) with a secondary bevel. If you feel you have to have the blade convexed all the way to the cutting edge, that's a modification you'll have to arrange yourself. When you mess it up, ship your knife back to me and I'll fix it for you and send it right back lickidy split. ...with a secondary edge bevel. If you're successful, way to go. My hat's off to ya. Every Fletcher Knife has a nice groove or guard to try and help keep you from accidently slicing you fingers off. It's not that I don't trust you, it's there more for me than you. I have a bad track record. The edges on this area are slightly rounded and smoothed for your comfort. The thumb ramp on all Fletcher Knives that feature them is meant to be nice and smooth and a natural part of the ergos. It is strategically positioned to put the added force directly over cutting edge. Many thumb ramps on the market today are absolutely useless in the real world because they are over a nice section of handle or choil. I don't know about you, but i don't use either handle nor choil to cut anything, so I don't understand why the knifemaker or manufacturer would give me a way of putting added pressure over either of these areas. I don't put jimping on them. I don't like jimping. After extended use, even with the slightest of jimps, it rubs the skin and I don't like it. The edges of the thumb ramps are slightly rounded and smoothed for your comfort. On knives without thumb ramps, the area where your thumb rests naturally is slightly rounded and smoothed. The only exceptions to this are earlier Pocket Kilos, which had a sharp spine from handle to tip. The spine of Fletcher Knives are slightly rounded on the edges for comfort. I understand a lot of people want to strike firesteels or scrape with the spine of their knife, so they want the spine sharp. I weighed all of the pros and cons to it and made the decision to make them comfortable. So there you have it. Why are some areas sharp, rough, or smooth. Now you know. Time to go to sleep. It's 2:58AM right now. Why the hell am I even awake?